Comes with Bearcom BC95 w/ battery pack, holder, Charge station and power supply. Has cosmetic signs on it. Some of them might has bended antenna and/or on-off button. We cannot fix situations we are unaware of. We appreciate your patience and opportunity to correct a situation if that happens. - Local pick up is available. These radios are awesome they work very well. They have loud clear audio even in a loud environment. 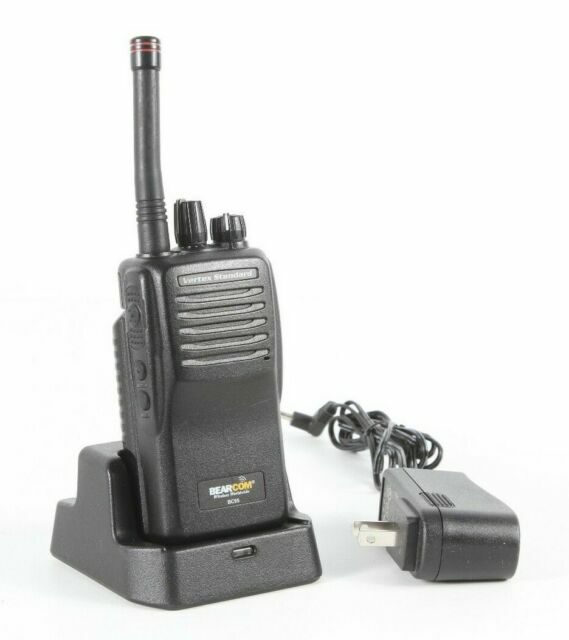 They are a good sized radio and are light compared to other radios. Batteries last a long time about 8-12 hours depending on the usage. These are perfect for big community event functions security or even camping and many other uses. These will not disappoint. I highly recommend getting the bc-95s over the cheap Chinese baofeng or other off brand radios that only work when they want to. You will always have strong solid comms using these. Plus they have and audio out put jack where you can plug in a Motorola mic. Only downside is the short antenna if you want better range throw the short antennas away and go get some longer ones.